Janet was born and raised in the San Francisco Bay Area. She received her Bachelor’s Degree from Stanford University in 1977 under the guidance of Nathan Oliveira. Janet has had a lifelong fascination with landscapes and was greatly influenced by early travels throughout Europe with her parents. Maui was a second home to the family. Janet resided in Santa Barbara for twenty years, raising her family and painting scenes of the west coast. Her two sons, Will Adler and Travers Adler, continue the family’s artistic tradition and they share ideas on many projects. In 1999, Janet returned to Lahaina, where she reunited with her childhood sweetheart. 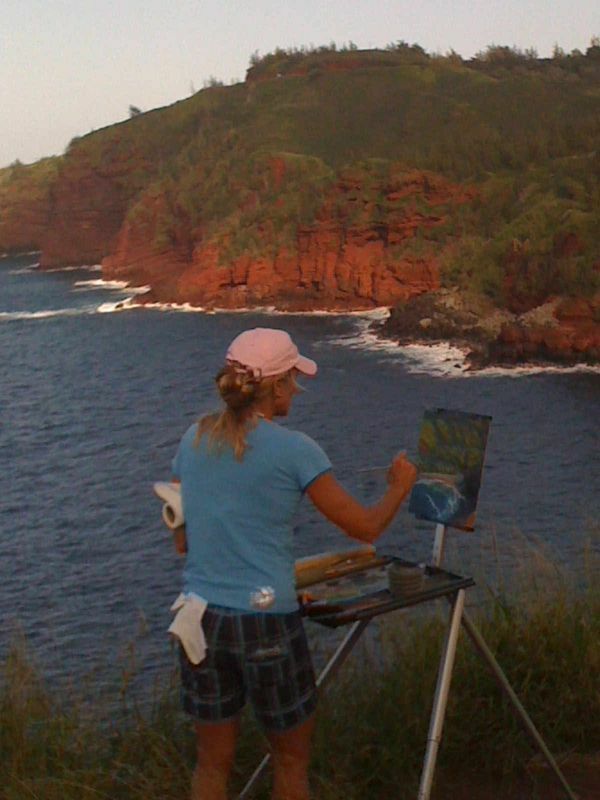 The diverse islands of Hawai'i provide constant inspiration for her paintings. Janet’s landscape paintings have evolved into contemplative studies with a deep respect for the uniqueness of each moment in time and man's relationship to nature. Her views often include historic references that evoke nostalgic moods and speak of the deeper spirit of a place, enticing the viewer into active participation and relfection. Each painting is a seamless blend of observation and recollection. In addition to Janet’s landscapes, her over four decade career in art includes architecture and drafting, computer graphics and design, wine labels, highway billboards, children’s illustrations, cartoons, and portraits. Visitors are welcome by appointment to stop by Janet's unique Lahaina Studio on Maui.